At the first month of 2016 I heard two very interesting stories about diet. One is that Oprah lost 26 pounds by bread based diet, which is guided by Weight Watchers; another story is by an Italian chef. He lost 101 pounds by pizza-based diet, which he followed his hometown's Mediterranean diet. Is this a sign that fad diet will go for carb-based diet? From TCM perspective, both too thin and too fat are caused by dysfunction of spleen. According to Five-Element theory cereals have the functions of supplementing stomach and invigorating spleen. If you don't eat cereals(healthy carbohydrates) you may lose weight temporally but you won't keep a healthy weight for a long term. Fad diet experienced from low fat low carb diet to high fat diet. No matter how hard people tried, obesity is still a problem and is increasing. The best is that forgetting about the fad diets, going for the nutrition balanced diet and choosing healthy foods according to your body's needs. When you follow the healthy eating you're sure to gain a healthy weight. 1.What should we pay attention to in Spring? According to Chinese Lunar Calendar, Feb. 4th is the beginning of the spring of 2016. We mentioned in previous issue that the liver is active in spring according to 5-element theory(wood element). We should get up earlier, go out with friends, and laugh often. Otherwise the liver qi might be restrained, and these symptoms may happen- getting angry easily, high blood pressure, hot and dry eyes, sleeplessness, constipation, stomach pain, etc. If some of these symptoms are happening to you, besides keeping a good mood, you may drink chrysanthemum tea, eat Chinese celery, baby greens, and bean sprouts. About the liver. From TCM perspective, the liver regulates qi movement, blood circulation, body fluid metabolism, menstruation, and mental activities. It also assists stomach and spleen to digest food. The liver stores blood, opens to the eyes, governs the tendons, and manifests on the nails. 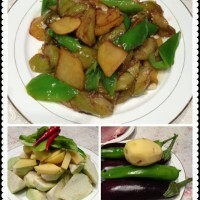 In Dongbei- Northeast of China there are many mixed vegetable dishes . Di San Xian is one of them. I heard some vegetarian friends like this dish. The ingredients include potato, eggplant, and bell pepper. Below is the picture. Diced potato, eggplant, and bell pepper; deep fry and then stir fry in soy sauce. Because it's a deep fried dish it's popular in restaurants, and so it's oily. 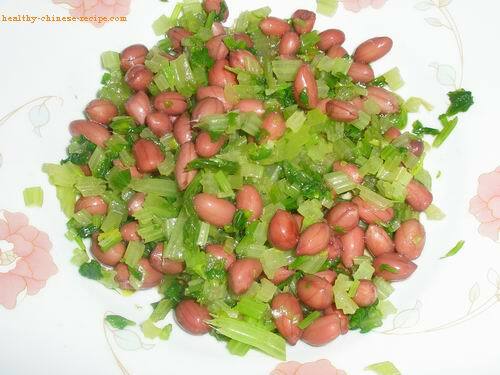 I have a good idea to cook healthy homemade Di San Xian: replace deep frying with baking. After diced, bake and stir fry in soy sauce. Healthy and delicious! Many people got cold during holiday. Holiday finished and cold cured, but cough continues. If you are at this situation you may try steamed orange. Below is the recipe. 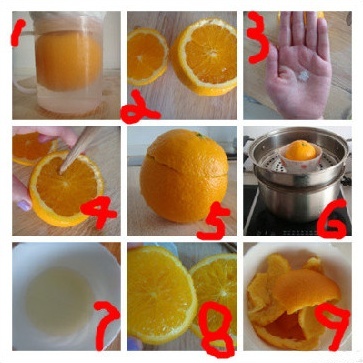 1.Wash orange. 2. Cut out a layer from the top. 3. Mix a pinch of salt. 4. Put in a bowl. 5. Steam for 10 mins. 6. Eat orange flesh ans drink juice inside the bowl. Please note, this is for cough caused by cold. It's also very effective for cough at the 1st or 2nd day of your cold . Please note, this is for cough caused by cold, not suitable for cough caused by heat.